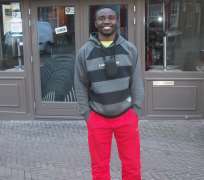 Swagga 4 Jesus singer, King Oogbodo, who is currently on vacation in Amsterdam, Netherlands, has explained why he's on vacation at the beginning of the year. According to him, 2015 is going to be a very big year for him because he will be very busy and have no time for vacation once he releases his sophomore album, Colossus, this year. “I can tell you confidently that 2015 is the year King Oogbodo will take over the music industry. I've been working on my sophomore album, Colossus, since late last year with the producers Shocker and SO Jeggs and I've been working so hard on it that I just realized I had to take a break.